Connoisseur Models loco kits have been designed, to provide a set of quality components, that will allow the modeller who has basic kit building skills to make an 0 gauge model of the prototype, to a standard of detail that is suitable for operating models on most 0 gauge layouts. They are not intended to be state of the art kits, though those who wish to upgrade their model through the substitution of various fittings and by fabricating some of the smaller superdetail items, can lift it into the showcase class, in the firm knowledge that the kit forms an accurate and economical base on which to work. All kits consist of etched components for body and chassis, with cast metal fittings. Boilers are pre-rolled and wire, screws, bearings etc are included. All kits require wheels, motor and gears to complete. Particular consideration is given to the instructions. These consist of text dealing with the general construction of metal kits, including recommendations on which tools to use etc and specific instructions relating to the kit. The majority of kits include a scale drawing of the prototype and the main constructional instructions, consist of isometric exploded diagrams, with short paragraphs of text and notes. It is assumed that the modeller will be happy to do some additional prototype research, to provide photographs etc. A list of reference books etc is included in the instructions. My good friend George Dawson of Majestic Models originally produced this range of kits of Scottish locomotives. When George retired he decided to sell his range of locomotives. 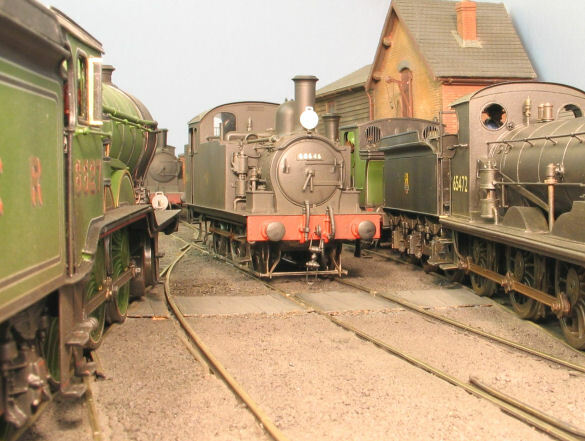 The kits had a very good reputation and as a selection of North British Railway locomotives would complement my range nicely I was very keen to purchase and produce them. The kits have basic slot and tab construction to help with the location of parts. The boilers and cab roofs are pre-formed. The instructions contain quality isometric exploded construction diagrams. All the parts fit together as they were intended but the final squaring up of parts and crispness of construction is a little more reliant upon the skills of the modeller than the kits that I have designed. They build into very nice and attractive finished models.